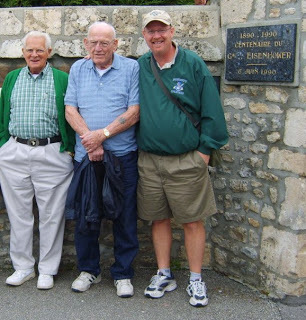 My husband Greg (Right) with Buck Compton (center) and Don Malarkey (left) two WW2 heroes portrayed in Band of Brothers. This was taken in Bastogne. For those of you who have seen the HBO miniseries, “Band of Brothers,” you may recall the choking-back-tears comment from Don Malarkey as he described his comrades of the 101st Airborne, many decades after WW2. “Brave, so brave… it was unbelievable.” Greg and I had the privilege of a lifetime 4 years ago, when we got to spend 2 weeks in Europe with Buck Compton and Don Malarkey, two of the paratroopers portrayed in Band of Brothers. We stood at the sea of white crosses in Normandy as a friend played taps. Don, Irish and emotional, wept openly as Buck wiped away a tear and swallowed. We walked with these old soldiers through the Bastogne forest where they once nearly froze and starved in foxholes to protect our freedom in the Battle of the Bulge. They remember their dear friends whose legs were blown off in this lovely green forest, once white with snow and red with blood and lit up with terrible fire and noise of war. I gathered pine cones on that misty summer day, to give to my children and grandchildren. To help me remember the sacrifice so many made to secure our freedom. We visited with a family whose parents/grandparents were liberated from their own home by Easy Company soldiers. The family showed us a room with a red stain on the floor. It was were a Nazi was shot and killed. They looked at Don and Buck with such admiration and gratitude. Everywhere we went these two vets were instantly surrounded when people heard that there were American paratroopers among us. They are rock stars in Europe where children grew up hearing of the “angels coming out of the sky” in parachutes to save them from the German soldiers. They are rock stars to me. Greg and I had lunch with Don this year as he was passing through town with a friend. He’s had to give up his beloved nightly nip of Johnny Walker for his health now that he is 90. His hearing is going, but he seemed awfully pleased when I kissed him on the cheek. 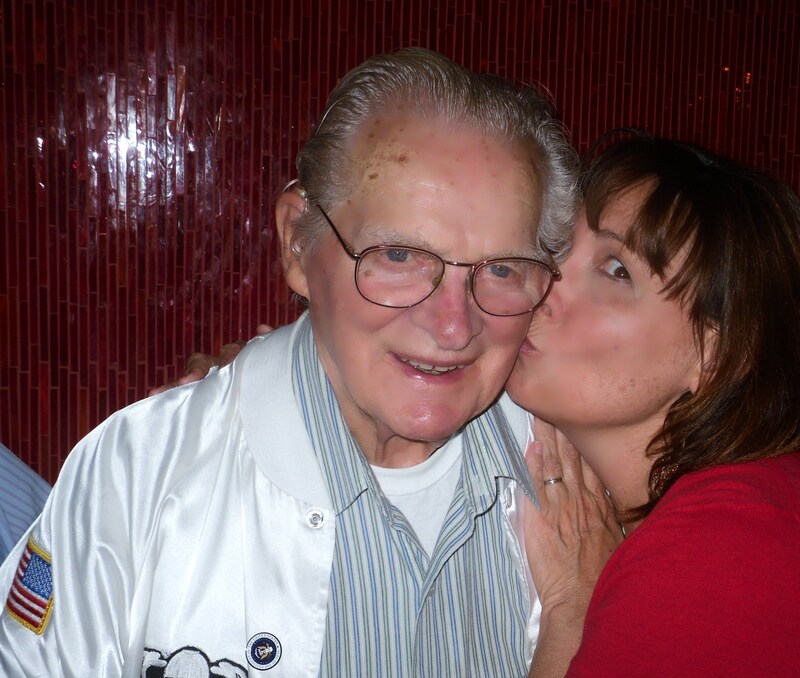 A kiss for a hero, Don Malarkey of “Easy Company” portrayed in the Band of Brothers. I doubt there will ever be a Memorial Day when I don’t think of that trip and those heart-tugging experiences, and of these men. Thank you to Don & Buck for sharing your stories (see information on their biographies below) and for risking your lives for our freedom. 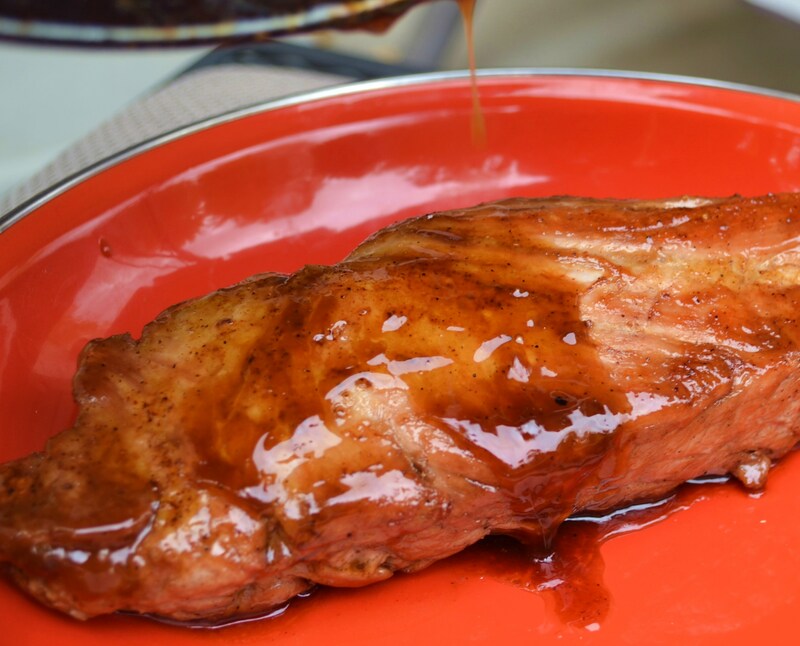 Since Don can’t toast Memorial Day with a glass of scotch anymore, I’m dedicating this Bourbon Pork Loin recipe to him and all the Easy Company men. (The recipe is also “easy for company.”) Since the alcohol burns off, it’s safe to serve to the whole family. It is one of Greg’s absolute favorite meals, and every man I’ve served it to looks heavenward with joy after they take a bite. 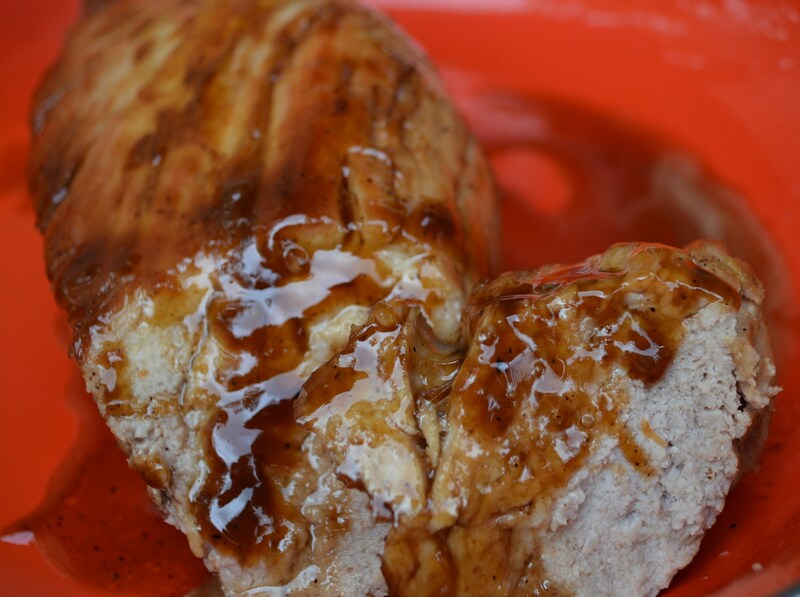 Rub the pork tenderloin all over with Cajun seasoning and brown sugar. Put oil and butter into an iron skillet (or other ovenproof skillet) over high heat. Once the oil is very hot, put the tenderloin into the pan, turning heat down a bit, and brown until golden on all sides, turning with tongs. Don’t worry about getting it done in the middle, just get it pretty and brown on the outside. Remove pan from heat. Pour bourbon over all and roll the tenderloin in the juices now in the pan. Cover lightly with foil and place in oven. Cook for about 20 minutes or until just done in the middle. 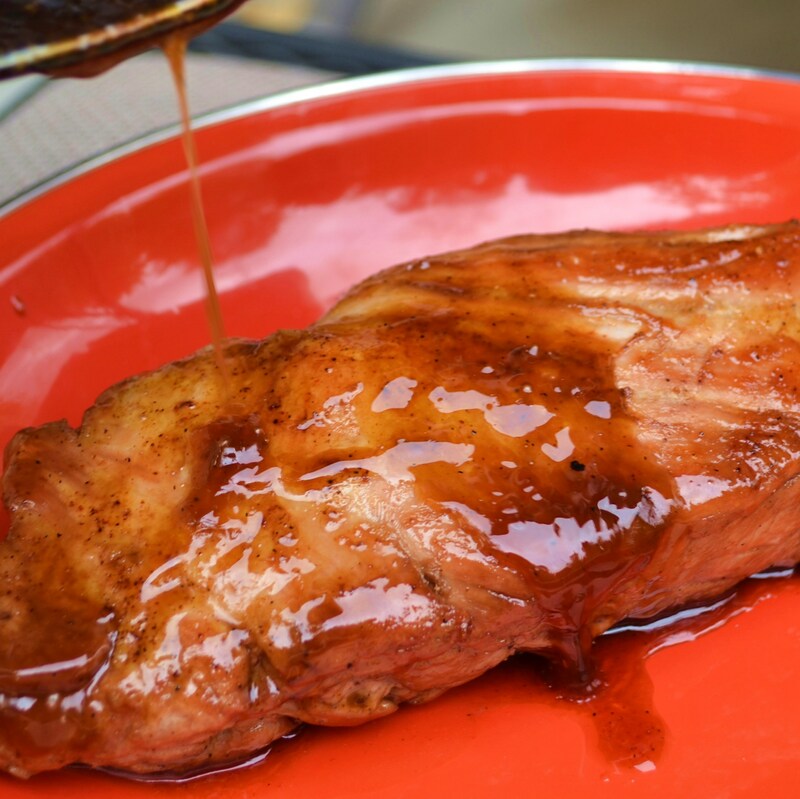 Pork loin is often overcooked and this is what makes it tough. If you have a meat thermometer cook until it registers 140 degrees. Remove from oven. 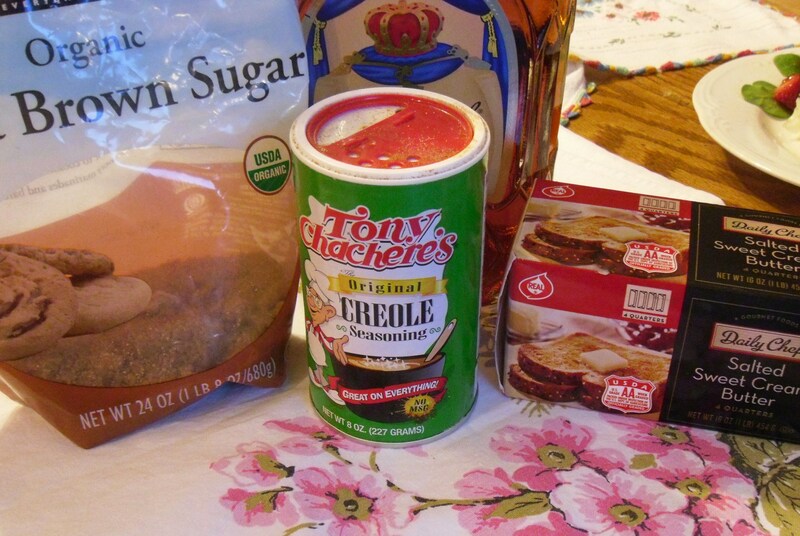 Let it sit for at least 5 minutes, covered to let juices redistribute. Slice just before serving in thin slices, ladling a little of the pan juices over it. 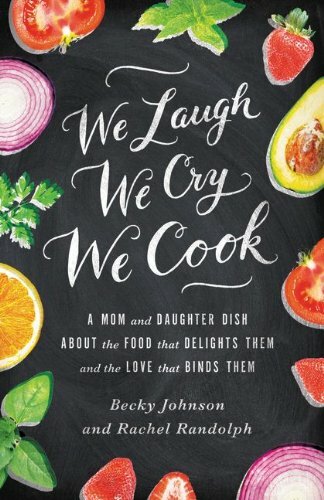 Delicious with baked sweet potatoes and a green veggie or salad. Note to Vegans or Vegetarians: This method can also be used to cook slices of tofu. Just do not cover it when you put it in the oven and remove earlier, after about 10 minutes. Recently Marcus Brotherton interviewed and collected stories from the 101st airborne (Easy Company) into a book called: We Who Are Alive and Remain:Untold Stories from the Band of Brothers by Marcus Brotherton.